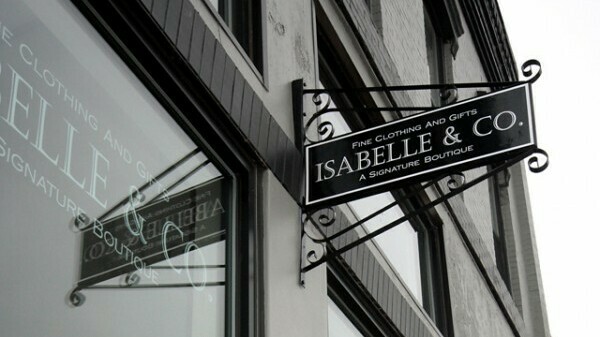 Isabelle & Co. not only leads the way in high-end women’s retail, but now in outdoor signage as well. The Eau Claire clothing boutique’s owner, Jessica Behrendt, recently installed a 90-degree sign (an outdoor sign that is hung perpendicular to the building face) outside her North Barstow Street shop, making her the first entrepreneur to do so in downtown Eau Claire (that we know of) and hopefully encouraging other business owners to follow in her footsteps. These aesthetically pleasing storefront signs not only make the downtown more inviting, but more navigable for drivers and pedestrians alike. Though the North Barstow Area Redevelopment Architectural Design Guidelines (released in early 2005) encouraged the use of these signs, Isabelle & Co. is the first to finally do so. “The store is already beautiful on the inside, and we wanted to make the outside beautiful as well,” said Behrendt. “People were also having trouble finding the store, so we decided to put up the sign.” It may sound simple and mundane, but details like these add up for a collective downtown experience. These signs make businesses easier to spot from the road or sidewalk and Isabelle & Co.’s 3-by-2 foot sign meets the 6 square foot maximum. With a great example now in place, we hope to see others like it pop up around downtown Eau Claire (hint, hint). Thanks, Isabelle & Co., for leading the way!